Assembly partitioning with an infinite translation is the application of an infinite translation to partition an assembled product into two complementing subsets of parts, referred to as a subassemblies, each treated as a rigid body. 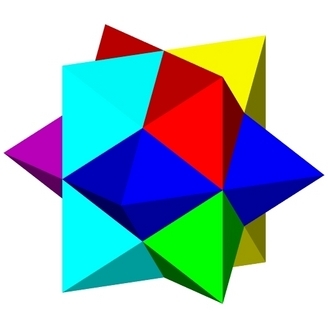 We present an exact implementation of an efficient algorithm, based on the general framework designed by Halperin, Latombe, and Wilson, to obtain such a motion and subassemblies given an assembly of polyhedra in 3. We do not assume general position. Namely, we can handle degenerate input, and we produce exact results. As often occurs, motions that partition a given assembly or subassembly might be isolated in the infinite space of motions. Any perturbation of the input or of intermediate results, caused by, for example, imprecision, might result with dismissal of valid partitioning-motions. In the extreme case where there is only a finite number of valid partitioning-motions, as occurs in the assembly shown to the right, no motion may be found, even though such exists. Proper handling requires significant enhancements applied to the original algorithmic framework. The implementation is based on software components that have been developed and introduced only recently. They paved the way to a complete, efficient, and elegant implementation. Additional information about some of these components is available at Arrangement of Geodesic Arcs on a Sphere project page.